The dbx DriveRack PA+ Loudspeaker Management System builds on the tradition of the earlier DriveRack PA”one of the world's most popular loudspeaker managers. Showcasing all the features that users around the world have come to expect, including easy setup, rock-solid reliability, and unparalleled sound quality, the new DriveRack PA+ goes to great lengths to earn its "plus " designation. With more settings, more control and enhanced circuitry, dbx DriveRack PA+ puts the sound you seek right at your fingertips. Although the DriveRack PA+ is loaded with functions and features, it is easy to set-up and use. The dbx exclusive Set Up Wizards walk you through system set up with easy-to-follow step-by-step instructions. Just pick your speakers and amps from the built-in list on the PA+, and then let the Auto Level Wizard fine tune the level settings of each speaker. You can then let the Auto EQ Wizard help you further optimize your sound. Finish up by using the AFS Wizard, which automatically sets filters to eliminate any feedback during performances. Within minutes, your PA system will sound like it was tuned by a pro! No experience required. 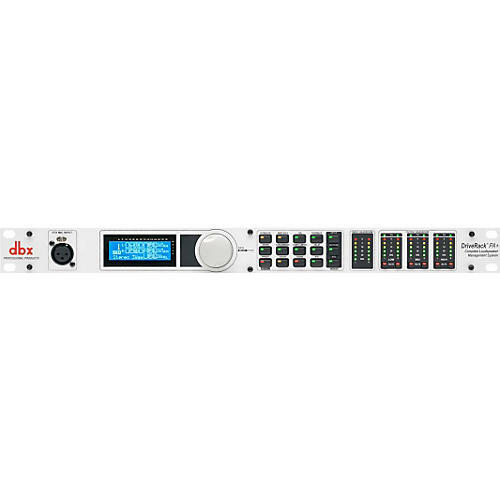 Get the most out of your PA with the dbx DriveRack PA+, the worldwide standard in loudspeaker management.